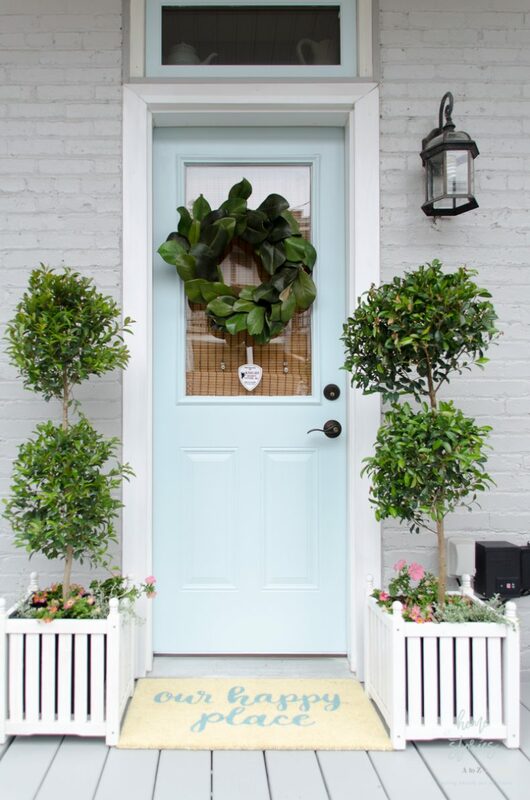 Learn how to refresh and transform a porch using BEHR® products and on trend paint colors from BEHR® Paint. This post is brought to you by PopSugar and BEHR® Color that’s True to Hue. 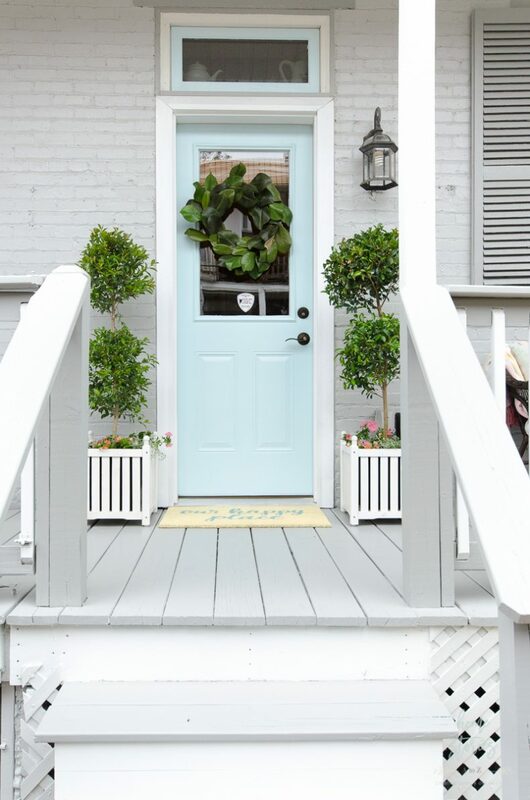 If you follow my blog, then you know that my front porch is lovely! 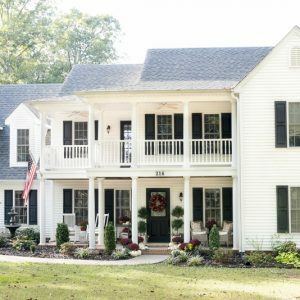 It has great curb appeal with on-trend paint colors, cute decor, and tons of charm. And then there is the back porch. How in the world did this happen? I’m so embarrassed to even show you this neglected mess; however, these before pictures should give you hope for any neglected exterior mess of your own! 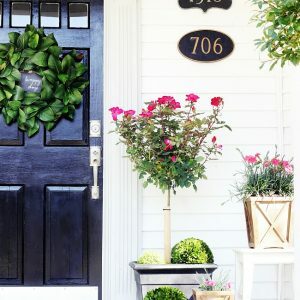 My blog’s tagline has always been “creating beauty out of chaos,” and today I’m going to show you how to take your chaotic, messy porch and turn it into a thing of beauty using BEHR products! Step 1: Pick your color palette. Let’s face it, transforming a neglected exterior is going to take some elbow grease. Before you grab a broom or bucket, I recommend starting with the fun stuff so you have the motivation and energy to do the tough stuff! Choose your color palette first and create a vision and direction for your project. If you’re not clear where to begin, check out BEHR’s 2017 Color Trends for inspiration. You can also use BEHR’s ColorSmart tool to find, coordinate, and preview your paint colors. 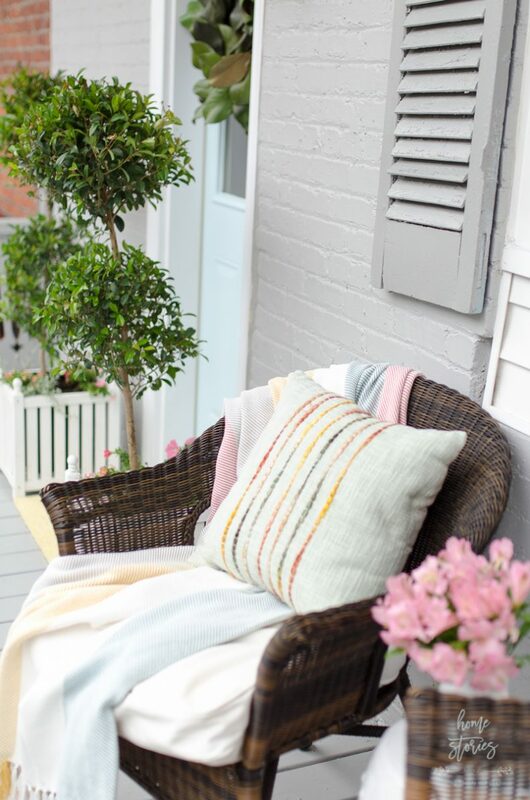 For our back porch, I wanted an updated look that complemented my existing home decor but with a fresh twist. BEHR’s Comfortable Palette was exactly what I was looking for! 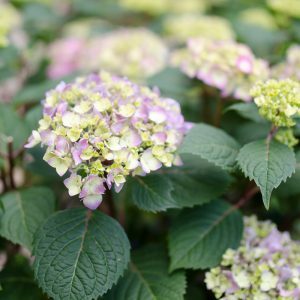 The muted pastels are classic yet feminine and trending! I knew I could easily pull together a polished look with this palette. Step 2: Clean your porch. Our porch was previously stained white, and the stain was flaking off. 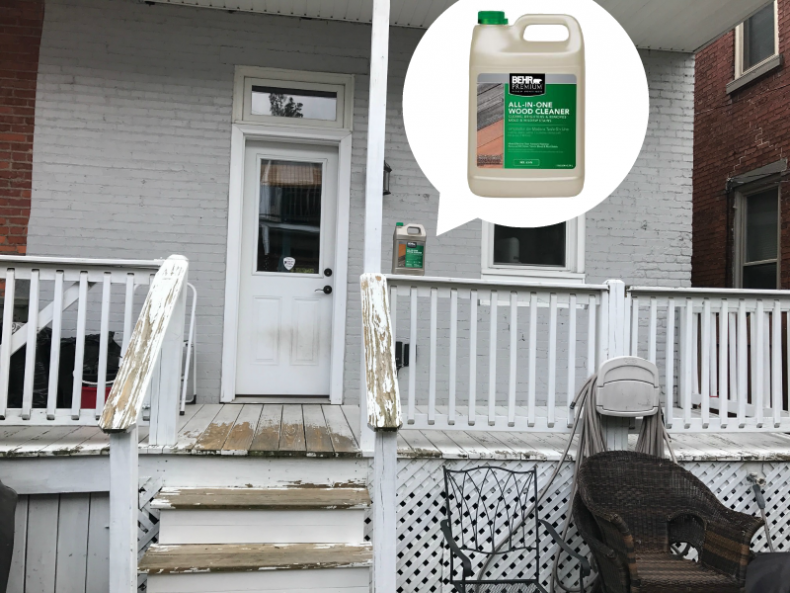 Following the package directions for cleaning, I used BEHR® Premium All-In-One Wood Cleaner to remove the tannins, dirt, mold, and mildew stains. Next, I sanded any loose stain from the porch before proceeding to the next step. 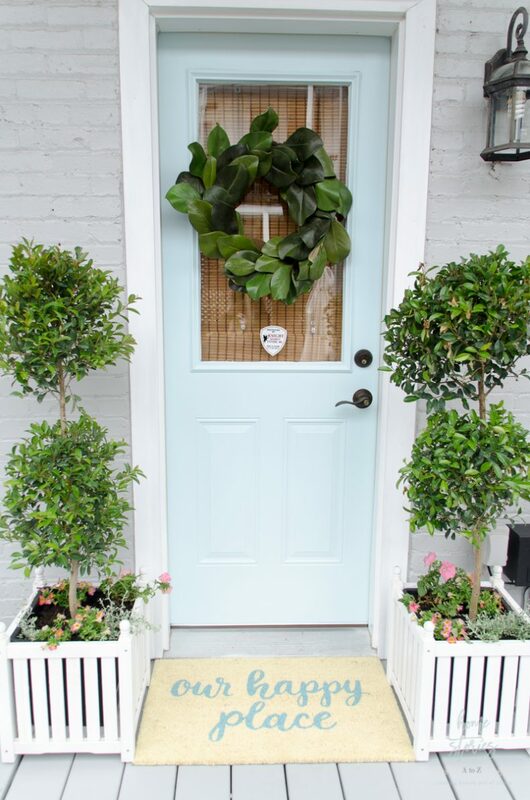 Step 3: Prime your porch. For best results on all paint jobs, always prime and always allow plenty of dry time between coats! Paint jobs often fail over time because of impatience. If you do it right the first time, you will save yourself the hassle (and embarrassment) of your space looking like another “before” picture! 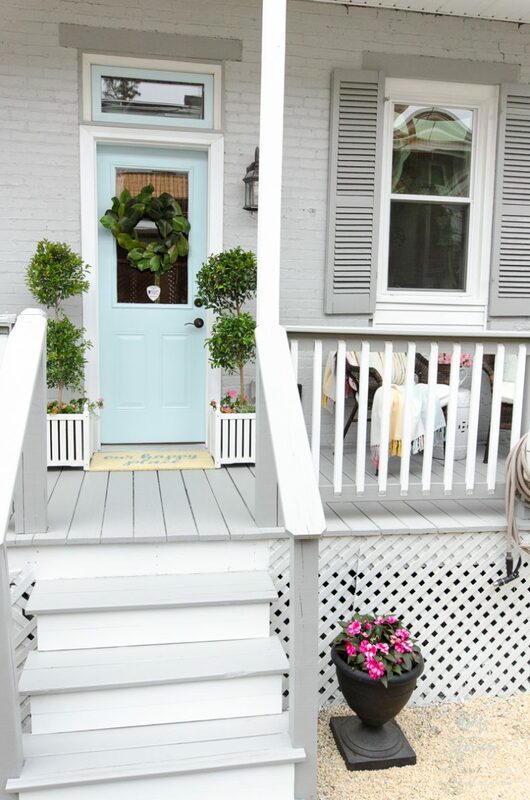 I used BEHR® Premium Plus Multi-Surface Primer & Sealer in a paint sprayer to prime our porch. It looked so much better just after priming! My neighbor even texted me to let me know how much better our porch looked. 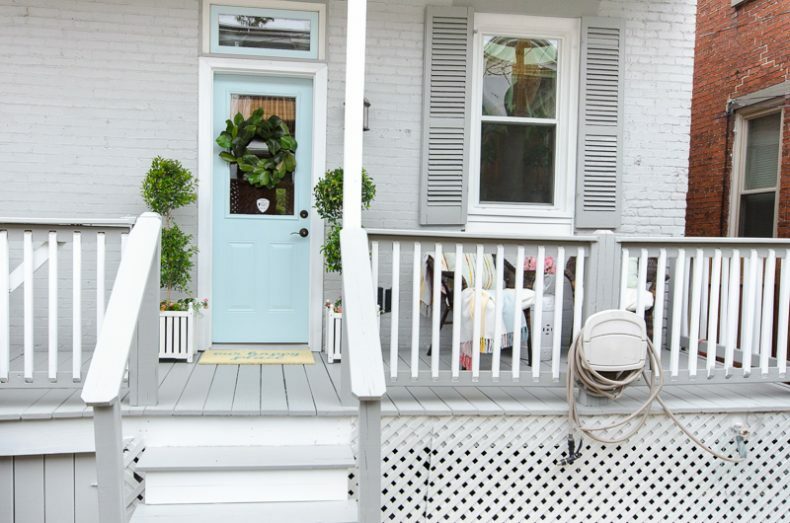 Step 4: Paint your porch with an exterior paint. 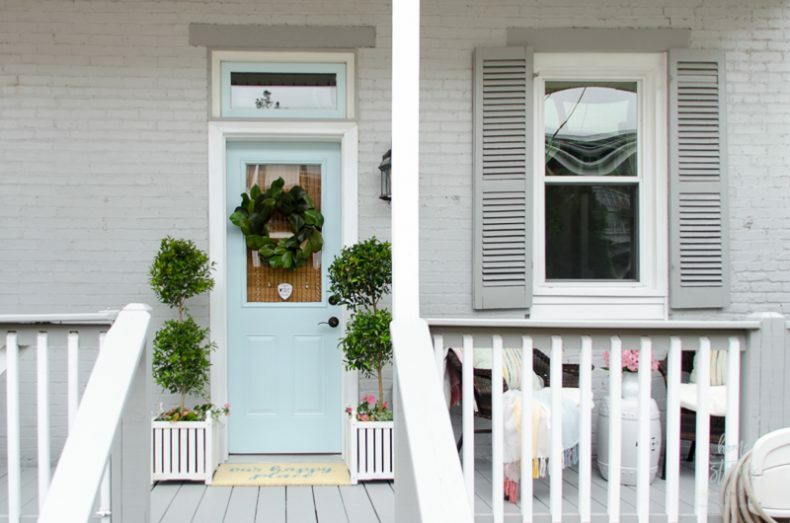 Choosing a quality exterior paint is imperative to the success of your paint job! BEHR Premium Plus Ultra® Exterior provides versatility and high performance in one. This paint is excellent for multiple surfaces and provides effortless coverage with long-lasting beauty. It is easy to work with and the colors are true to hue. I used BEHR® Premium Plus Ultra Close Knit Satin Enamel Exterior Paint on the brick wall and on the lattice. Our brick wall was already a similar shade of gray, however the Close Knit is a shade lighter and brighter. I love how going just one shade lighter can renew the look of a space! 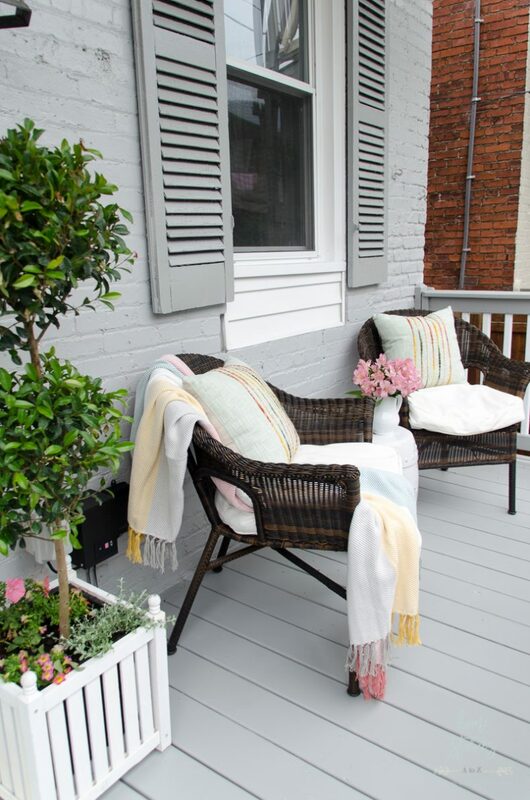 On the porch shutters, and trim, I used BEHR® Premium Plus Ultra Great Graphite Satin Enamel Exterior Paint. It’s a beautiful gray that hides dirt and is the perfect shade of cozy gray. BEHR® recommends using BEHR® Porch and Floor Paint for best results if you’re painting your porch floor. 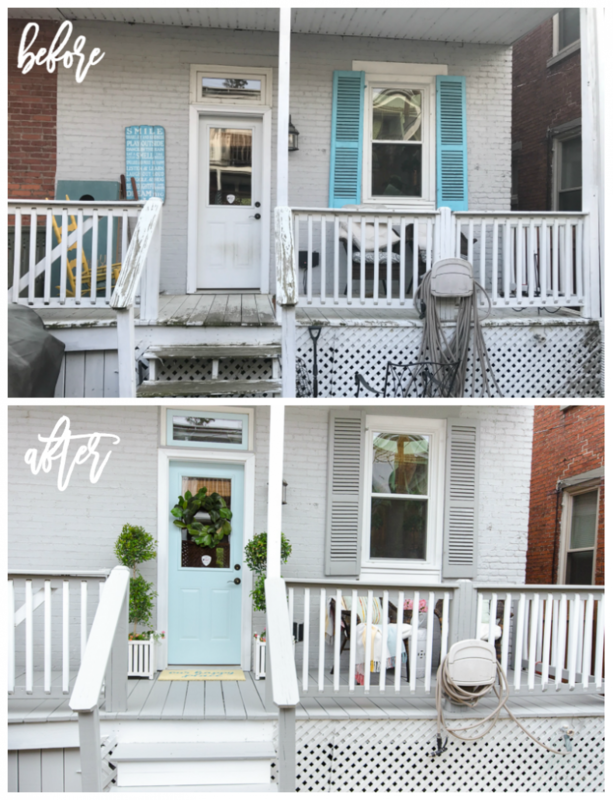 The gorgeous blue door is painted with BEHR® Premium Plus Peek a Blue Semi Gloss Enamel Exterior Paint, and I could not be more pleased with how beautiful it looks! The white trim in BEHR® Premium Plus Ultra Pure White Satin Enamel Exterior Paint makes everything pop. 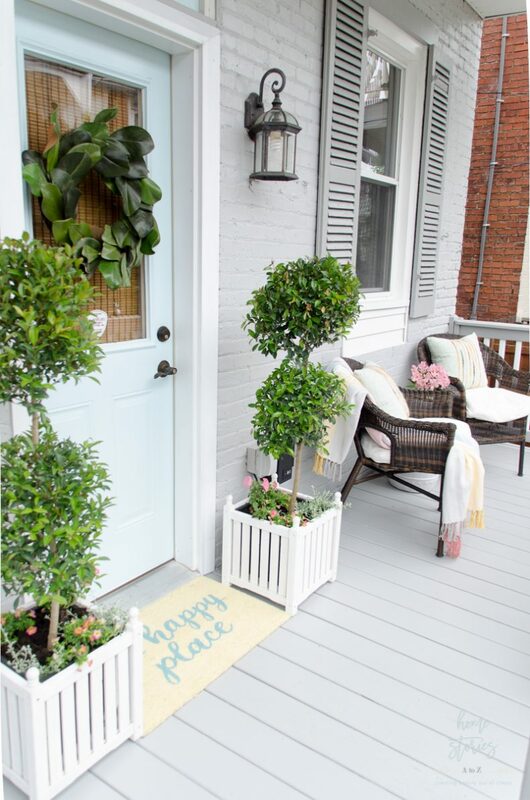 Step 5: Decorate your porch! Once you have allowed your paint to properly dry and cure, it’s time to decorate! 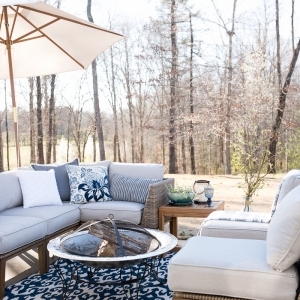 Use your color palette as a guide and incorporate pops of colors with pillows, flowers, outdoor rugs, and throws. I could not be more thrilled with how my back porch turned out! It went from an eyesore and embarrassment to a place of beauty in just a week using BEHR products! 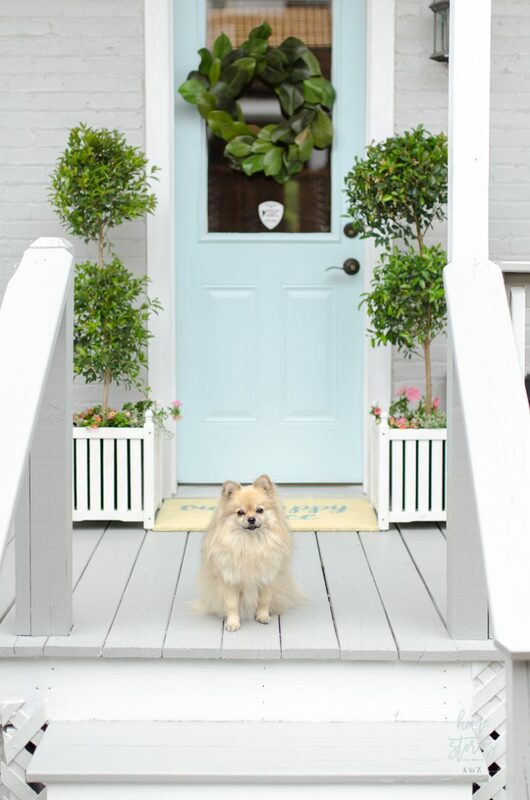 The porch is now Pomeranian approved! Perhaps I’m reading a little too much into it, but my female pom, Eowyn, has spent a lot more time sunbathing on the porch since it’s been decorated and painted. Our happy place indeed! 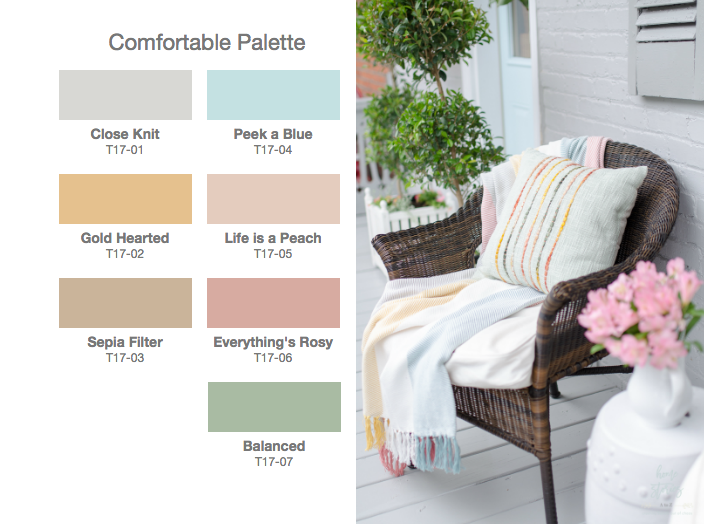 Thanks for stopping by to check out my BEHR® paint back porch reveal! I hope you now feel a bit more inspired and empowered to tackle a neglected exterior space of your own. WOW!!! so Beautiful I know you would do something wonderful love the Blue Thank you for sharing enjoy your week …. Such a dramatic difference! I love the combination of the blue door against the gray. Thanks sweet Brooke! It was so hideous before I wasn’t sure I’d be able to revive it from the dead. Wow, what a transformation. The porch looks fabulous. Thank you Marty! I’m always amazed at the transformative power of paint.